The Gard is one of France's most underexplored regions, a fact which strikes any visitor as profoundly strange considering that it is so steeped in history and natural beauty. Whether it's the Roman grandeur of Nimes, the Renaissance allure of Uzes or the medieval charm of Aigues Mortes, the towns and cities of the Gard are incredibly well-preserved and will quickly transport you back through the pages of history. The landscape is as diverse as the remnants of its history. From the low salt marshes of the Camargue to the high green valleys of the north-west, there is much to see, and our collection of the best places to stay in Gard provide great bases, whichever part of the region you plan to explore. This is a perfect place for a holiday where you can enjoy culture, good food and plenty of sunshine. There is a vast Roman aqueduct called the Pont du Gard that stands between Uzes and Nimes, the latter being once a retirement settlement for discharged Roman army veterans. It is a wonderful sight to behold and stands as a symbol for the region, full of grandiose and beautiful architecture, as well as a wealth and depth of history. Nimes is striking for this very reason. An utterly spellbinding place where the might and splendour of the Roman empire are made immediately apparent, it has two significant Roman sites, a Roman temple and an amphitheatre respectively. Not only that, but Nimes retains a tradition of bullfighting, the sort of euphoria-inducing bloodthirsty sport that their Roman ancestors would've understood. Smaller towns like Beaucaire share this tradition, and the low-lying marshes strewn along the coastline are used as breeding grounds for the bulls. This area is called Camargue and is home to pink flamingos, egrets and wild horses, while also being used for the salt-harvesting industries. On the other side of the Pont du Gard is Uzes, whose stunning architecture and open-air markets are the envy of the region. Walking through the winding cobbled streets, you are struck by the gorgeous Renaissance facades of the buildings, particularly that of the Duke's Castle, whose imposing 11th-century keep looms grandly over the town. Northwest from Uzes one enters Cevannes, a landscape of wide green valleys, snaking mountain rivers and rolling hills. A truly magical place, it is ideal for long hikes and gentle walks alike and the views are magnificent. As you head further inland both the climate and food changes, the air gets cooler, and the food more classically French. Then there is the old city of Aigues Mortes, meaning "Dead Waters", a truly amazing place. Originally built in 102 BCE, it was rebuilt in the 13th-century by Louis IX, and its looming walls and ramparts are still very well preserved. Spend a day walking along the ramparts and admiring the views, or check out the local museums and learn about the city's significant role in the Crusades, being the place where the 7th and 8th crusades were launched. As you get nearer the coastline, you encounter charming seaside resorts like those in Petit Camargue, and some great beaches like Espiguette, which is the longest beach in the Languedoc. Visit the Roman amphitheatre in Nimes and the Roman temple, both of which are incredibly well-preserved, and serve as symbols for the grandeur of this beautiful city. Check out the Duke's Castle in Uzes with its beautiful Renaissance facade, Gothic chapel and imposing 11th century keep. If you fancy seeing a bullfight, head to either Beaucaire or Nimes. Go to Camargue, the salt marshes, and see the bulls roam freely amongst legions of Pink flamingos and wild horses. The Pont du Gard, a Roman aqueduct connecting Nimes and Uzes, an example of Roman architectural prowess at its finest. Go for a hike through the gorgeous green valleys of Cevennes and visit the ruined abbeys along the way. This is a picturesque region and our pick of the best places to stay in Gard often make the most of that; set in quiet villages or completely off the beaten track surrounded in gorgeous countryside. 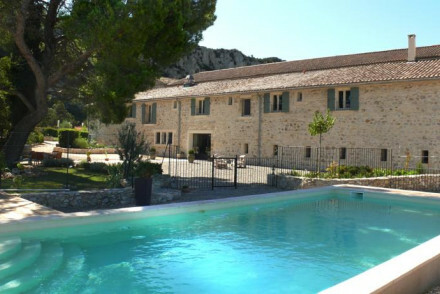 A beautiful boutique B&B the Les Sardines aux Yeux Bleus is set in a secluded hamlet, offering 3 rustic-chic rooms that are perfect for families and couples alike. There is an outdoor pool and a charming garden. Great value for money. Mas de La Rivoire is a former 14th-century winery, complete with an on-site chapel, offering 5 modern-meets-rustic rooms with exposed stone walls and wooden beams. There's an on-site volleyball court and table tennis. Great for families. The truly magnificent Chateau de Varenne overlooks the Rhone Valley, with 11 traditional and extremely cosy rooms. Take cooking classes with the chef or go on a wine tasting tour from the hotel. In a spellbinding location with lush green gardens complete with an outdoor pool. 4* luxury. 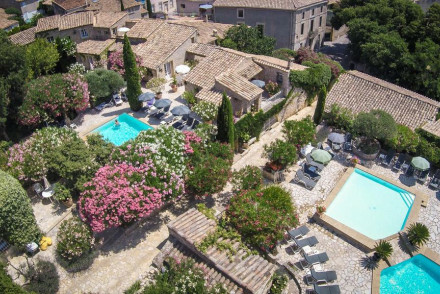 Just a short drive from the beach and in a prime location for exploring Aigues Mortes, this elegant hotel, Villa Mazarin is set within a 15th century building. The rooms are traditionally-furnished, and there is a restaurant, spa and indoor pool. A wonderful break ideal for families. Hotel La Maison de Sophie is an art-deco townhouse with heaps of character, offering 5 extremely elegant rooms in the heart of Nice. Expect chandeliers, Persian carpets and tiled floors. In a quiet part of town, there is a secluded outdoor pool set within a fragrant-scented garden. 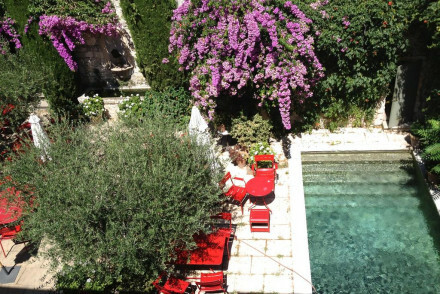 The value for money Hostellerie Provencal is a charming guesthouse in the heart of Uzes, offering 9 pretty rooms and a restaurant overseen by two Michelin-star chefs. 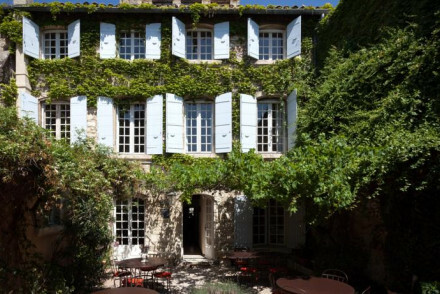 L'Artemise is a truly spectacular gourmet restaurant with 5 rooms on the outskirts of Uzes, set within a beautifully-restored 16th century house. Full of contemporary art, there is a spoiling spa, a large outdoor pool and a lovely garden. Ideal for couples. The luxury B&B, Clos du Lethe, is a renovated farmhouse offering 5 sophisticated, high-end rooms. The views are gorgeous, particularly from the infinity pool. Only 6km from Uzes. Our partner Booking.com has a wide range of villas and apartments in the nearby area for those looking for something a little more private. Fly to Nimes-Ales-Camargue-Cevannes Airport and take public transport to your destination. If you want to rent a car we recommend you contact our partner Rentalcars. The best time to go is during the summer months, when the temperature ranges from 13 to 31 degrees. It gets cooler as you head further inland. Expand your search to include all our properties in the Côte d'Azur. Discover our top picks in France. A delightful hotel set in a stunning 16th century house. L'Atelier fuses its rustic design with contemporary furnishings to produce comfortable, attractive rooms. After a day's exploring Avignon's papal history, relax in the garden with a glass of wine or take in city views from the roof terrace. Families - Don't leave anyone behind - you can even bring the dog along! Value chic - Great value, central location - a no fail option! 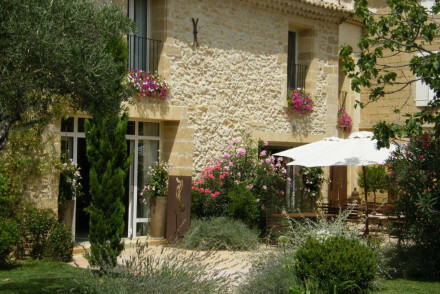 Fabulous country hotel in the middle of vineyards, fruit orchards and olive trees. Excellent accommodation for families and groups. Airy and bright bedrooms, four swimming pools, great restaurant and wine list. 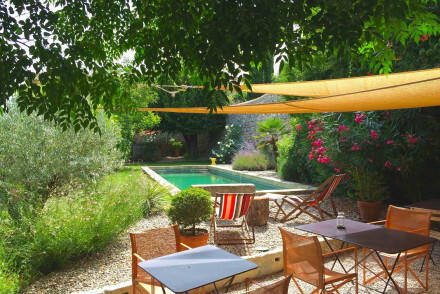 Charming little hotel and sister guest-house in Uzès, the perfect base from which to explore Provence. The pretty rooms are cosy and traditional in style with floral fabrics and period features. The restaurant is overseen by two Michelin trained chefs and serves only the best local produce. 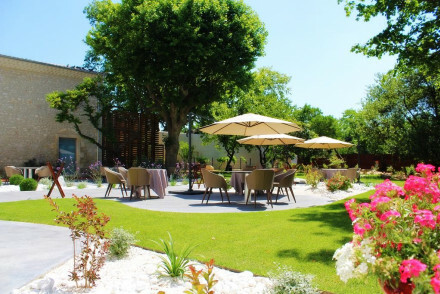 L'Oustau Camarguen is a welcoming hotel on the edge of the Camargue region. Its contemporary design focuses on spacious, comfortable rooms. Explore the rich culture of the Camargue area or simply unwind by the pool. Its affordability makes it great for families and groups. A great find. Local markets - Explore the local markets and culture of the Camarge. An elegant hotel set in a charming 15th century building. Traditional rooms with all the mod-cons. Spa, indoor pool and excellent French restaurant. Just a short drive from the beach, and in a central location to walk the Medieval streets of the town. A wonderful weekend break for families. Historic - A lovely 15th century building. Sights nearby - Hours drive from Avignon, Arles, Orange, Nimes, Uzes, Montpelier or Aix-en-Provence. A charming stone-walled hotel with an excellent spa and swimming pool. 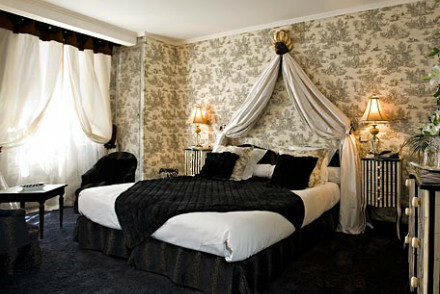 Tasteful bedrooms and suites decorated with Provencal wallpapers and rich fabrics. Lovely breakfast courtyard. 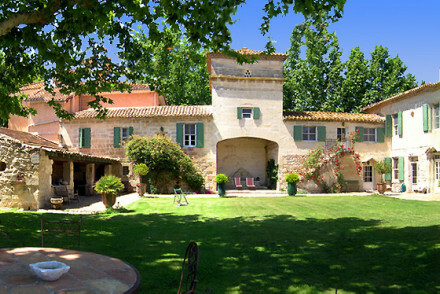 An understated and relaxed setting to explore Provence from. 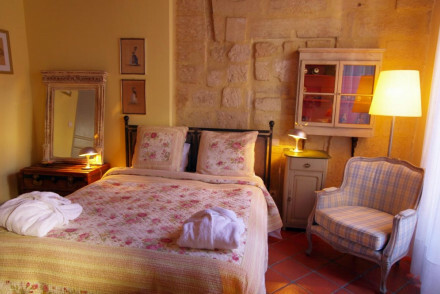 Chic and charming renovated 18th century merchant's house inside the fortifications of Aigues-Mortes. The hotel features a restaurant, bar and a lovely outdoor pool. Comfortable, contemporary rooms feature exposed stone walls, wooden beams and antique furniture. Ideal for history lovers. Local exploring - A charming and conveniently placed base to explore the region from. Sights nearby - The 13th century towers, turrets and ramparts of Aigues-Mortes are worth exploring. Out-of-town is the Tours Carbonneire. Fabulous rustic farmhouse B&B with a selection of rooms, family suites, and self-catering apartments. Wooden beams, oak floors, fireplaces, terraces, lavender-scented gardens and a swimming pool. A picturesque countryside retreat for families, groups or couples, and at great value. Chic and modern rooms in a renovated farmhouse in the village of Colliashe. Facilities include an outdoor swimming pool, a wellness centre and a jacuzzi. The rooms themselves are minimalist in design and have unique colour schemes. Near Avignon and Nines, ideal for exploring the region. Spa breaks - The on-site Wellness Centre features everything from a sauna and whirlpool to on-request massages. Country Escape - The village lies beside the River Gardon and is surrounded by vineyards and lush, green farmland. Sights nearby - Visit the Papal Palace in Avingnon, beautiful and rich in history. 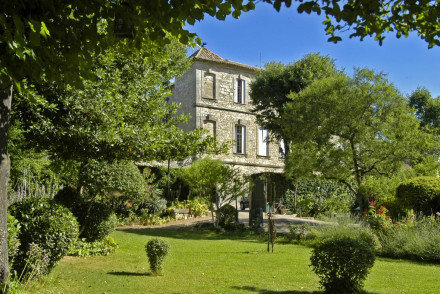 A charming B&B in the picturesque Provençal medieval village of Saint-Laurent-des-Arbres. With a charming garden and simple, comfortable rooms, it's perfect for a quiet, relaxing holiday. Explore the quaint village or simply recline by the glorious outdoor pool. Country Escape - A charming and intimate country home offering secluded romance in the rustic chic rooms and lovely gardens. Local exploring - On the border of Provence and Cévennes, it's perfect for exploring both regions. Sights nearby - Take a day trip to Avignon and visit the magnificent Papal Palace. Local markets - Explore the bustling market of Saint-Laurent-des-Arbes. A beautiful sandstone boutique B&B in a secluded hamlet setting. Three rooms and three apartments with wooden beams, pastel walls, and fireplaces. Lovely swimming pool and garden. Fantastic for groups or families, and excellent value for money. Rustic-chic. A sweet B&B and former winery in the heart of la Gard, with a handful of rooms and cottages. Expect modern-meets-rustic decor with exposed stone walls and high-vaulted ceilings, contemporary artwork, furniture and some have a terrace. Ideal for totally relaxing. Country Escape - A tranquil 14th century winery estate complete with chapel, beautifully-maintained gardens and surrounded by green vineyards. Sights nearby - Sommieres, a nearby medieval town, is worth checking out and provides beautiful views of the countryside. Swimming Pool - Outdoor swimming pool. Putting relaxation at the fore, Le Spinaker sits quietly on the Port Camargue marina. With beautiful views out over the marina and comfortable, tasteful rooms, it's a great place to stay whilst exploring the natural beauty of the Camargue. Perfect for people on sailing holidays coming into port. Local exploring - Explore the beautiful surrounding marshlands of the Camargue, on foot, two wheels or horseback. 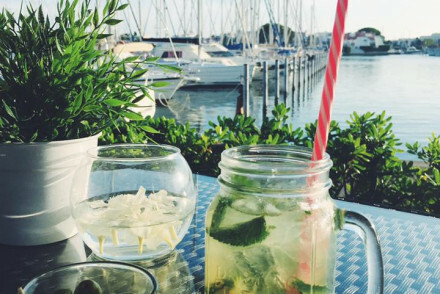 Sailing - With Port Camargue marina on the doorstep, it's the perfect place to stay after docking. Amazing Baroque-Rococco style in this gorgeous 18th century coaching Inn. Rich drapes, fresh linen and soft lighting. Totally spoiling with it's own spa and outdoor pool surrounded by palms, orange and olive trees. Relax by the fire in the Napoleon 111 bar. An oasis of calm in this historic city. Sights nearby - Pont Du Gard within 11 miles. UNESCO site. Restrictions on children - Children must be over the age of 10. A fabulous restaurant with four contemporary rooms attached. Dine on Chef Jérôme Nutile's stunning menu showcasing the finest "haute couture" cuisine in an atmospheric converted farmhouse. Chic rooms are warm yet modern in style. Located just 3km from Nimes. A true foodies destination. Families - Housing a fabulous restaurant which has been accredited a Michelin Star. Sights nearby - Visit the impressive Nimes Cathedral and the restored Roman temple, Maion Carree. A whimsical chateau set in picturesque mature gardens just outside Uzés. Elegant rooms are individually styled using a mix of contemporary and traditional styles. A fantastic restaurant serves up regional fare and there's a pool, bikes for hire, tennis court and boules lawn too. Country Escape - An idyllic rural escape in a picturesque part of rural France. A charming farmhouse with award-winning restaurant. Quaint country-style rooms feature cast iron beds, exposed stonework and large sash windows. A lovely rural escape with pretty gardens and a generously proportioned pool to relax by. Enjoy Michelin Star regional cuisine at the restaurant. Foodies - Foodies will be heaven with the Michelin star restaurant, celebrating the cuisine of Provence, and providing cooking classes! Country Escape - A pretty spot, perfect for a rural break with stunning views, lovely vegtable gardens and cosy interiors. Sights nearby - Visit the Palais des Papes just a 15 minute drive from the property. Cooking classes - Make the most of the cooking classes on request from expert chefs. Fantastic country house with a very relaxed atmosphere. Walled gardens, sunny swimming pool, shady terraces, and contemporary chic rooms. A real home from home, if home were in the South of France. A gorgeous farmhouse in Provence. Sandstone walls, lavender filled landscapes, lemon groves, and an excellent table d'hotes. Romantic rooms, suites, and one apartment have huge bath tubs and boutique furnishings. The perfect spot for couples or families. Total relaxation in rural luxury. Sights nearby - Uzès has panoramic views of the countryside around. 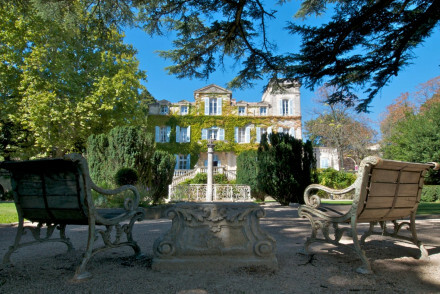 In the heart of the provence countryside sits this charming hotel overlooking the Rhone Valley. Enjoy a stay in the lovely comfortable bedrooms, then fling open the pretty blue french shutters and revel in the view of the beautiful gardens and swimming pool. 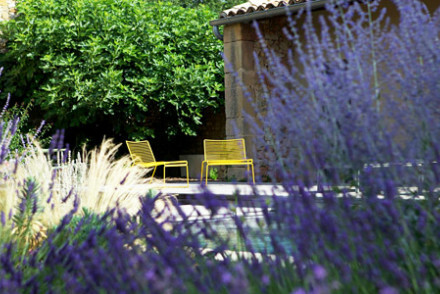 A picture perfect place in Provence. 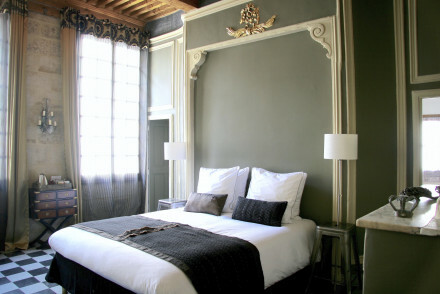 Sophisticated townhouse B&B in the centre of Uzes. Grand rooms and suites with vaulted ceilings, chandeliers, black and white chequered floors, fireplaces and private terraces. Lovely breakfast courtyard and walking distance to restaurants. Spectacular. Art deco townhouse B&B with bags of character. Elegant bedrooms with Persian carpets, chandeliers and tiled floors. Step out to the fragrant jasmine filled gardens complete with swimming pool and bougainvilleas. Well situated in a quiet part of town yet close to most of the sites. A popular choice. Total relaxation - A rare slice of tranquilty in this hectic city, relax in the jasmine infused garden and take a dip in the pool. Sights nearby - Short walk brings you to the Nîmes Arena, this splendid monument is the best preserved amphitheatre of the Roman era. 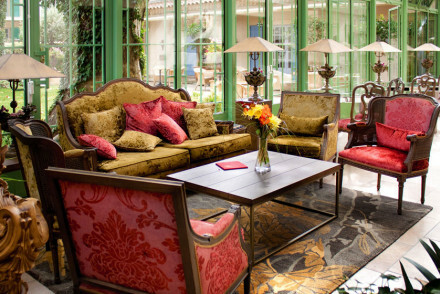 A stunning hotel with all the romance and joie de vivre of Provence. Golden-stone Renaissance architecture, cypress and olive trees surrounding terraces, a pool perched on a mount overlooking the valley, sumptuous rooms and suites, and flamboyant Provencal cuisine. Utterly dreamy. 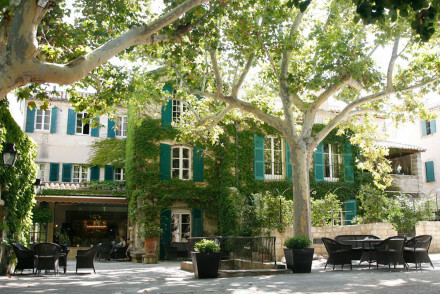 Foodies - The restaurant serves picturesque Provencal cuisine and is much revered in the region. Luxury - Utterly luxurious; stylish, gourmet, very romantic in architecture and ambience. A wonderful blend of historic and contemporary. The 14th century ivy clad former monastery was renovated in 2007 creating rooms with character and unpretentious luxury. 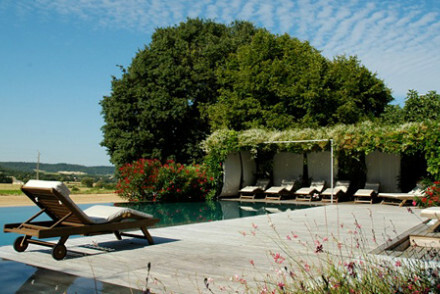 Relax by the pool, break a sweat on the tennis court, and visit the Michelin starred restaurant in the stunning gardens. A delightful guest house with relaxing swimming pool, mini spa and outdoor bar. Five bedrooms where contemporary touches sit side-by-side original features - think modern art on ancient exposed stone walls. Dining is table d'hote style and features the best of the day's market. A hidden gem. Heavenly gastronomic restaurant with rooms on a hillside, just outside the Uzes with lovely views and gardens. 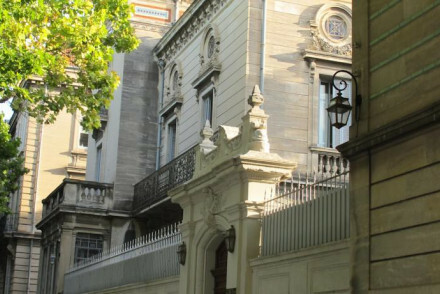 This beautifully restored and peaceful XV1 century Mas exhibits contemporary art by well known artists. The "surprise" Menu changes daily & follows the seasons. A memorable experience. Fantastically designed B&B farmhouse with just five luxurious rooms. 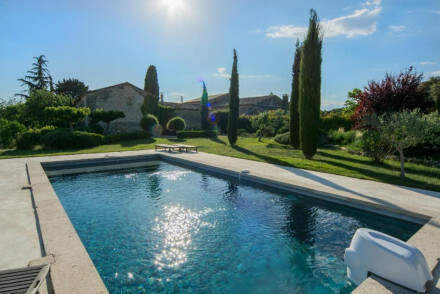 Stone walls laid bare, granite bathrooms, and high end interior design - a really sophisticated spot in countryside surroundings, just 6km from historic Uzes. 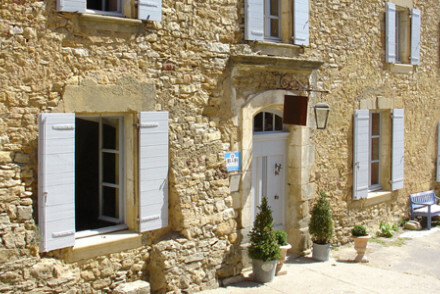 Sights nearby - Explore historic Uzes only 6km away. 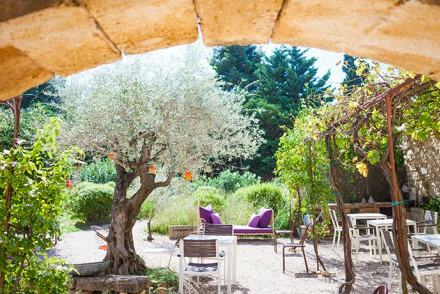 Lying a little outside Nimes, Bien Loin d'Ici feels like a quiet retreat into nature. The three double rooms have contemporary decor, en suite bathrooms which lead onto private terraces boasting views and private hot tubs. The outdoor heated pool set amongst wildflowers is absolute bliss. Superb!